The first and only multi-frequency RF device that is FDA cleared, the Reaction by Viora optimizes the thermal effect at different tissue depths and improves treatment accuracy. Every provider has been waiting for the machine that could do it all � and now it seems Viora may be the one to do it. With the introduction of the Reaction RF, Viora may just corner the cellulite reduction and skin tightening market with its ease of use and its capability to treat a multitude of skin concerns. While the Reaction by Viora is not limited to these areas � here are specific areas where the Reaction by Viora can make the most difference. The Reaction by Viora offers three treatment applications � allowing for a multitude of procedures that can be performed non-invasively and comfortably for the patient. Each applicator can target specific tissue depths with a fourth option, which combines all three of the other frequencies. User friendly, the Reaction by Viora is easy to operate and will define the future of body contouring. While cellulite cannot be cured, the appearance of cellulite can be dramatically improved with the Reaction by Viora. After 6 treatments at 35 minutes each, there is a dramatic improvement in lax skin and a reduction of cellulite appearance. In addition, there is visible improvement in skin texture. Sometimes, 100 crunches a day will never match the results of Reaction by Viora. After 8 treatment sessions at 20 minutes each, results showed circumferential reduction and the waist�s curve is more apparent. Facial wrinkles can often age a person prematurely. The Reaction by Viora addresses the wrinkles while contouring the face for a more defined look. After one treatment, dramatic reduction in the appearance of the nasolabial folds is noticeable. The After photo was taken following two treatments. More often than not, skin tightening is performed on the face and the neck and jowl areas are neglected. The Reaction by Viora offers and easy solution to both: after three treatments (4 week intervals, 20 minutes per session) there is noticeable improvement in the lax and sagging skin on the jowl and neck areas. 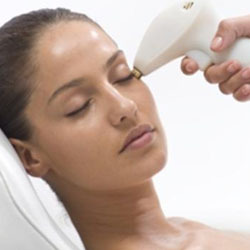 Viora is a market-leading manufacturer and technology provider of microdermabrasion, electro-mesotherapy, light-based and advanced radiofrequency systems for the global aesthetic and medical markets. All of the products are developed by a team of veteran engineers in the industry as well as medical experts including physicians, surgeons, dermatologists, medical researchers and independent clinical directors. Viora�s products are represented by strong distributor partnerships in over 58 countries around the globe, with an ever-expanding network of support. No matter what your vision is, our mission is to reveal your potential.